The SR20DET engine produced by Nissan is a 4 cylinder 2.0L performance engine. The somewhat confusing SR20DET name is part of an engine code created by Nissan. The “SR” is the family name, while the “20” denotes the displacement, 2.0 liters for this case. “D” indicates the valvetrain is dual overhead camshaft, “E” tells us that this model has electronic fuel injection, and finally “T” represents that the engine is turbocharged. This well-known Japanese performance engine was normally produced in cars in the Japanese and European markets. The Nissan models available with this engine were the Bluebird, Pulsar, 180SX, Silvia, Avenir, Liberty, R’nessa, 200SX, and Sunny. The SR20DET engine was first made available in 1989 in the Nissan Bluebird. The most well-known applications for this engine are in the 180SX, 200SX, and Silvia engine models. The engine was produced until 2002. This engine was and still is popular for its high performance output for such a small, light engine. Many of these engines are no longer in stock condition as this engine is very popular for part swaps to further increase performance. This engine was not offered in any regular offerings in North America, but due to the demand for this engine, there are many shops that specialize in swapping the SR20DET engine specifically. The SR20DET was broken into several different modifications. The red top and the black top versions were quite similar, offering 205 hp at 6000 RPM and 203 lb-ft of torque at 4000 RPM. 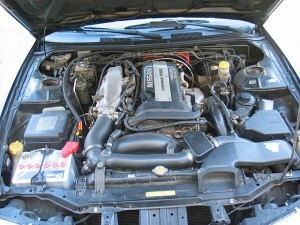 The next engine was the S14 model, which was introduced in 1995. This engine offered a bump in horsepower of 220 hp at 6000 RPM, although the peak torque remained 203 lb-ft. In 1999 the S15 model was introduced. This engine was capable of 250 hp at 6000 RPM. The exact displacement of this engine is 1.998 liters, or 121.95 cubic inches. This engine has both a bore and stroke of 3.386 inches. This bore/stroke relationship allows for optimal performance at high engines speeds. With any performance engine, especially a smaller performance engine like this one, weight is critical. The SR20DET is constructed of Aluminum block and heads. To add strength and robustness, especially to handle the increased pressure from this turbocharged engine, the cylinders were lined with iron liners. This engine also used cast aluminum pistons, although they were treated with a special thermal coating at the top. The valvetrain for this engine, as already alluded to, is dual overhead camshaft. This 4 cylinder engine has a total of 16 valves, with 2 intake and 2 exhaust per cylinder. Other material considerations were also taken into account to provide robustness for this performance engine that operates at high engine speeds and under the increased pressures from the turbocharger. Some of these improvements include a deep skirt design as well as larger than normal crankshaft and connecting rods for this displacement of an engine. The 2.0L, 4 cylinder SR20DET engine by Nissan is a well-known performance engine. This engine is particularly popular among tuners; as some dedicated shops exist that solely swap the SR20DET engine. This turbocharged engine offers up to 250 hp in some applications, which is very strong for this size engine, although with updated tuning kits now available, the performance can significantly exceed this. Although this engine was never offered in normal production in the United States, it is not rare for someone to buy a compatible Nissan car and install the SR20DET. Although there are certainly many of these engines still available, it is very likely that the parts are not stock, as this engine is commonly customized.